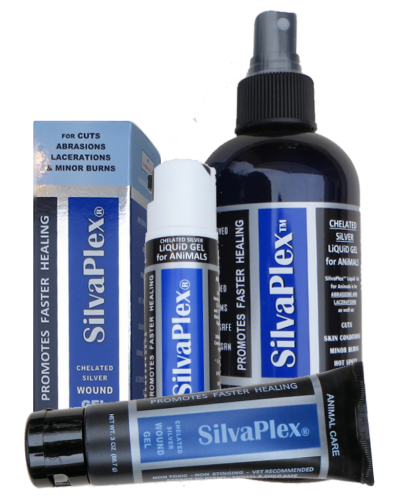 SilvaPlex® was created for the topical treatment of cuts, abrasions, lacerations and minor burns. Available both as a gel or spray, SilvaPlex® promotes faster healing than the leading brands. The naturally derived, non-toxic formula is free of odor, alcohol and Triclosan. Upon application, SilvaPlex® forms a barrier against germs while soothing inflamed skin on burns and reducing bleeding on cuts and abrasions. The secret to SilvaPlex® is our patented technology, COMPLEX Ag 21™. This proprietary Chitosan-Silver chelation allows SilvaPlex® to attach to the wound like a magnet and form a protective shield around it. This allows for faster and more complete healing compared to other over-the-counter wound care products. Purchase SilvaPlex® products online now! Unique Chitosan™-Silver Complex provides an invisible Germicidal Barrier. Silver Works™ Shampoo is pH balanced for all breeds, coat types and colors. It promotes healthier skin and coat with brighter whites and more vivid colors. Conditions and adds volume. Developed by veterinarians and recommended by professionals. Purchase SilverworksTM Shampoo online now!